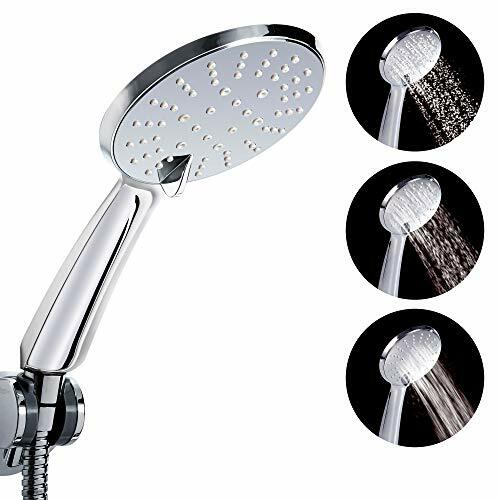 WATER SAVING: This chrome shower head use at least 20% less water than industry standard due to it\'s internal design, saving water and saving money. 3 FUNCTIONS SHOWER HEAD: Three sprays water flow -full body spray, massaging spray, full spray with massage meet your fits of shower, enable you to relax and enjoy a natural SPA at home after a series of working pressure . HIGH - QUALITY : Engineering grade ABS constructed, ensuring quality and longevity; Multi-Layer plating chrome finish is highly reflective for a mirror-like look that works with any decorating style, build to resist scratches, corrosion and tarnishing. EXTRA LONG SHOWER HOSE: The hose of shower head is about 1.5m, allows you a wider shower range, it\'s easy for you to shower yourself, your kids, your pets or showering the toilet; its quality construction refuses all the leaking and winding. EASY TO INSTALL: No need to call a plumber - installs in minutes with just one hand-tighten connection. We chose to use international general purpose interface, quickly and easily connect to any standard shower arm . Extra-long stainless steel hose (1.5m) included.